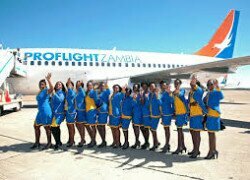 THE Zambia Amateur Athletic Association (ZAAA) has signed a memorandum of understanding (MoU) with Proflight Zambia Limited to raise funds for development and promotion of athletics in Zambia. The MoU signed on Friday will see Proflight take up the High Performance sponsorship in this years’ MultiChoice Inter Company Relay (ICR) to be held on the June 25 at the Lusaka Show Grounds. ICR chairperson president Elias Mpondela said he was humbled that Proflight had come on board to assist in promoting an integrated approach to Health Response & Wellness. “Our goal is to identify talent and enhance it and that is only possible through the support of different stakeholders including Proflight. I am happy that Proflight has partnered with us in promoting good health too,” he said. Other ICR sponsors include Multi Choice Zambia, Zambian Breweries, Airtel, MKP Group, Bata Shoe Company, ZESCO, Zambia State Insurance Corporation and Save The Children in partnership with Latkins.